David Thuli Wins Set of Cleveland Irons! 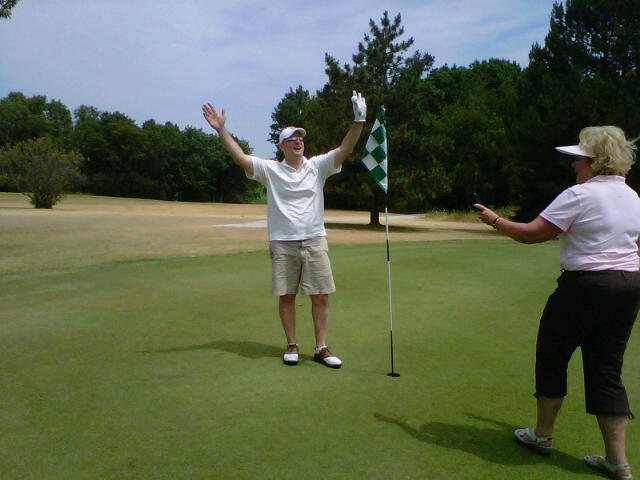 Congratulations to David Thuli of Wisconsin on his auxiliary prize winning hole in one during the North Point Community Church Golf Tournament which took place at Scenic View Country Club in Slinger, WI on July 14, 2012! Thuli aced the par 3 17th hole which measured approximately 139 yards with his 9 iron and was awarded a set of Cleveland Irons, compliments of Hole In One International, for his feat. Hole In One International’s hole in one insurance policies includes auxiliary prizes on non-target par 3 holes which measure at least 135 yards, as well as free tee signs! Ready to insure a hole in one contest of your own? Give one of our experienced contest consultants a call today at 800-827-2249… or email us! All of our quotes are completely free and no-obligation! Plus, you can take advantage of our Free Tee Prize offer, which is good for each and every golfer in your golf outing! Home » Blog » David Thuli Wins Set of Cleveland Irons!